Simon Keelan (Monkstown), Ger Brooderick (Kinsale) and Davey Barry (Douglas) pictured at the Munster PGA Captain’s Prize at Youghal Golf Club. 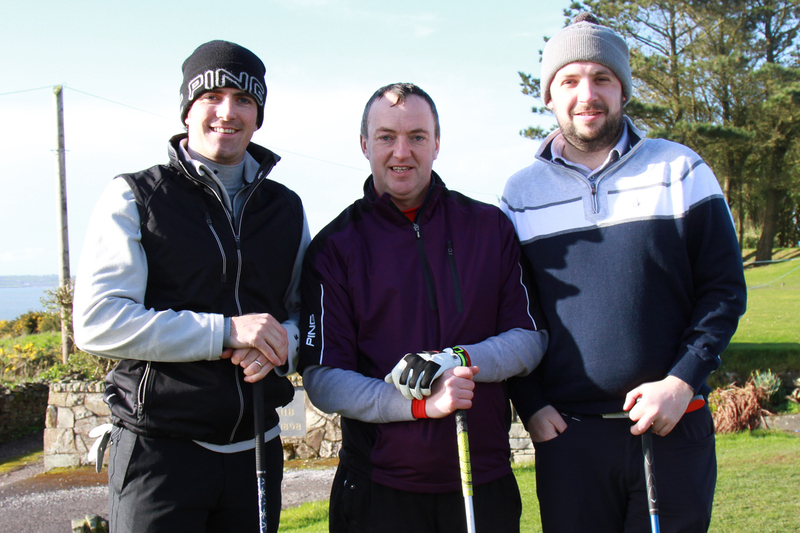 Cahir Park’s David Ryan won his second event in the PGB Munster Winter Series as he won the Captain’s Prize in Youghal. Ryan shot a winning one under par 70. He held off a trio from Kerry as Danny Sugrue (Killarney), David Higgins (Waterville) and Liam Higgins (Waterville) all finished with 71. Christian Porter (Halpenny Golf) was fifth with a 72 and Cian McNamara (Monkstown) was next best with a 73. Although it was an impressive performance from Ryan, the story of the day was the second placed finish by Liam Higgins. The veteran from Waterville shot a 71, bettering his age by one at the Taylormade sponsored event. In a nice touch Liam told his assembled peers that Youghal was the first club he joined in 1963. A few years later he departed Cork and amateur golf as he joined John Mulcahy when they both realised a dream as Waterville was restored as a golf course. Higgins should be an inspiration for all seniors, still playing golf almost every day. Although most of his golf is played in Waterville, he’s a regular in Dooks and Killarney as well as several appearances at the Munster and Irish Region PGA events. The second placed finish was made more special as it was matched by his playing partner and son David. Despite his commitments to the European tour over the past few years, David is a great supporter of the Munster PGA and is also a regular on both the Munster and national circuit. There were many links to Youghal, as it was Youghal where David Ryan started his PGA training twenty years ago. Youghal has changed over the years, especially with the addition of new holes but it still provides a test to all golfers with only one breaking par and three matching it. Munster PGA Captain Liam Burns was delighted with the turn out on his home course, and it was over 20 years since the PGA last held an event there. Although the wind was up and almost everyone was caught in the heavy showers the course was in great condition so early in the season. On Monday next the Premium Golf Brands Winter Series returns to Monkstown for the annual Morgan O’Donovan Perpetual Trophy. This is the third staging of the trophy remembering the popular PGA Professional and a full timesheet is expected. After that the final event on the PGB Winter Series is competition in Waterville on Monday 23rd. The Irish Region schedule has been launched and as it stands there’s only one event scheduled for Cork this year. Cork Golf Club will host their annual pro-am in August, although there are several other events planned in Munster. March is here and qualifying rules are in place for all Open qualifying competitions. The first major trophy will be decided on Sunday 15th when Fota Island will play host to the Top Golfer Fota Senior Scratch Cup. Entry to the 18 hole competition is €40 and bookings can be made through the club or via the Top Golfer website. For anyone wanting to get in a practice round or two in Fota, open singles take place every Wednesday.